Solartron ISA - High performance instruments for the life of your reservoir. 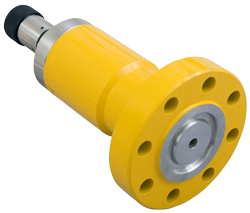 Operating subsea to ultra deepwater depths of 16,400 ft (5000 m) and high process pressures up to 10,000 psi (690 bar), the SST3010 GP is one of the most accurate and stable deepwater gauge pressure transmitters on the market. Its unique silicon crystal sensor technology provides high accuracy and long-term measurement stability. Solartron ISA’s SST family sets the global performance standard for subsea measurement instrumentation in the oil and gas industry. Used by leading exploration companies, SST products have an unsurpassed service history in the field, even in the most demanding and hostile installation environments. Solartron’s 40 years of flow measurement experience have made us the experts in pressure measurement technology. For subsea applications, only the best pressure measurement technologies should be employed. This is especially critical if the pressure measurement will be used for flow calculations, as long-term inaccuracy can lead to significant fiscal errors. The SST3010 GP is equipped with the Yokogawa innovative silicon crystal technology which has proven more accurate and more stable than competitive technologies. In fact, the technology is four times more sensitive than traditional piezo-resistive sensor technology used in competitive products.